Every business owner in America pays at least two types of taxes: federal income tax and self- employment tax. There are several other types of taxes including sales tax and state income tax, but federal income tax and self-employment tax are the two largest. If you made $5,700 or more in 2009, you will need to pay federal income tax. This income can come from being an employee or from owning a business. $5,700 is the typical amount of a deduction for a single person. It is adjusted by a few hundred dollars every year. Americans report their income and tax due on a Form 1040. Be aware that business owners report their profit on a form called Schedule C Profit or Loss from Business and attach it to the Form 1040. 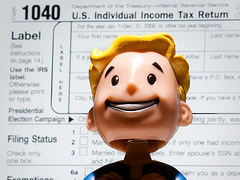 Go to the IRS website to see what it looks like: http://www.irs.gov/pub/irs-pdf/f1040sc.pdf. Schedule C is for sole proprietors (meaning only one owner); different forms are used if you are a partnership or a corporation. On the Schedule C, a business owner lists all his income and expenses by certain categories that the IRS picked out. You may notice that these categories may not fit your business. For example, there is no category for internet fees. A CPA (Certified Public Accountant) can be very helpful in sorting out your records and filling out the Schedule C correctly. I put an example of a teenager’s Schedule C in my book Teens and Taxes: A Guide for Parents and Teenagers. Your “bottom line” on the Schedule C is your profit, or what the IRS calls net income. That amount is what gets taxed. The American tax system is graduated, sort of like a wedding cake in layers, called brackets. The bottom layer is income under $5,700 and that is not taxed at all, the next layer up to $8,375 in income is taxed at 10% and the the next layer up to $34,000 is taxed at 15% (these thresholds are for single people in 2009). Most American families fall in the 15% tax layer (or bracket). Most teenagers are in the 0% or 10% brackets. You probably know about federal income tax, but you may not be aware of another tax on the Form 1040, called the self-employment tax (or SE tax). SE tax is Social Security and Medicare taxes for self-employed people and business owners. The SE tax rate is approximately 15.3% of your profit. If a teenage business owner has a profit of $400 or more, he will owe self-employment tax. The $400 threshold has not been adjusted in decades. Many teens who have a business may not owe federal income tax, but they do owe self-employment tax (at 15.3% of their profits). For example, Tom is a teenager with a nice-sized profit of $7,000 in 2009 from his business. Tom will owe $81 in federal income tax. Not too bad. But, Tom also will owe $989 in self-employment tax. He owes more in self-employment tax than in federal income tax! I call the self-employment tax a hidden tax because a lot of new business owners don’t know about it. And it is buried in the middle of the back page on the Form 1040 and is pretty easy to miss. Taxes are due on April 15 and unfortunately the IRS wants their money. Make sure you plan ahead for the fact that you will owe federal income tax and self-employment tax on your profit. How much will you owe? That’s a difficult question to answer because it depends on your expenses and other income you might have. The best thing to do is visit a CPA who can help you estimate your taxes. But as a rough rule of thumb, save 25-30% of your profit to pay your federal income tax and your self-employment tax. You may need to pay your state and city income tax as well. Does it sound like a lot of your hard-earned money is going to taxes? The best way to keep taxes low is to keep good records of all your expenses, plan ahead and work closely with a CPA who can advise you. P.S. If you earned money babysitting or mowing grass, there might be special tax breaks for you. You may be what the IRS calls a ‘household employee’ and do not have to pay self-employment tax. Visit TeensAndTaxes.com for details. Carol Topp, CPA is the mother of two teenage daughters. She enjoys working with teenage micro business owners. Her goal is to make taxes and accounting easy to understand via her website, books and webinars. Her next webinar, Teens and Taxes, is scheduled for March 4, 2010. Register for the no-cost webinar at TeensandTaxes.com. Carol has written 1 article(s) for JuniorBiz.com.